President Trump roiled markets yesterday when he said his administration would likely keep tariffs on Chinese goods until he's certain Beijing is fully cooperating with the terms of a trade deal. That could mean years of negotiation, acrimony and tariffs, given the nature of the changes being discussed. Why it matters: Trump's remarks on Wednesday played to investors' worst fears about how much longer the trade war between the 2 countries could continue. Stocks fell from their highs of the day — the S&P 500 dropped from above 2,850, which it had touched for the first time since October — after the news. Remember, China isn't paying the tariffs. U.S. businesses and consumers are. Tariffs are "a consumption tax ... they hurt the economy," as Trump's former economic adviser Gary Cohn pointed out earlier this month. 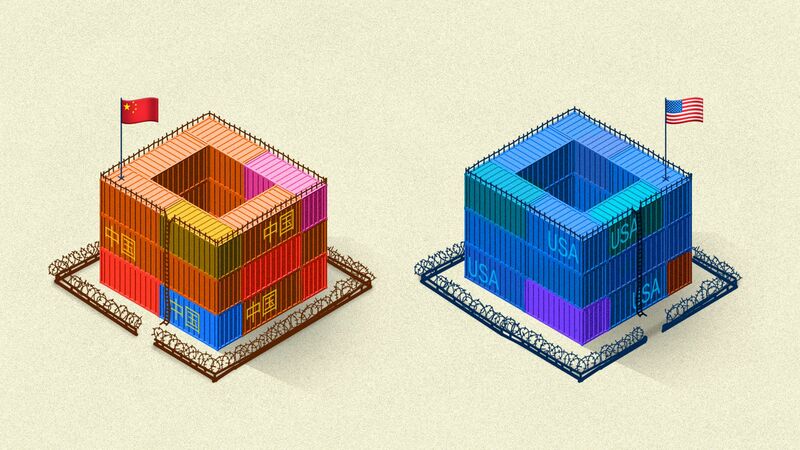 The bottom line: While it now looks to be on shakier ground, an agreement between the U.S. and China on trade would be just the first step in a much longer negotiation process. NAFTA began as a proposal by Ronald Reagan in 1979 and was signed by President Bill Clinton. The market is likely in for more surprises and more tariffs in the meantime. 3. Brexit: A "national humiliation"
A poll Wednesday found that 9 out of 10 Britons say ongoing confusion over when, how and if their country will leave the EU is a "national humiliation." Driving the news: The public is divided about whom to blame, though few blame the EU. One in three (34%) say the primary fault lies with the British government. Every time you think the Brexit omnishambles can't get worse, it gets worse. European Council president Donald Tusk said that he wouldn't agree to extend the Brexit deadline to June 30 unless Theresa May got the UK Parliament to agree to her deal. Theresa May said that she wanted to extend the Brexit deadline to June 30, despite Tusk's statement, and despite the fact that the speaker of the House of Commons has ruled that she can't even put her deal to a vote (for a third time). May gave no indication of what she might do if she doesn't get her desired extension. Jeremy Corbyn, the leader of the U.K. opposition, refused to even participate in a meeting of party leaders trying to resolve the crisis. May said in her statement that "we will now not leave on time with a deal on the 29th of March." Increasingly, the risk is that Britain will end up leaving on time without a deal. Enter Operation Yellowhammer. The bottom line: 9 days before the U.K. is due to leave the EU, the range of possible outcomes is as broad as ever — from a chaotic no-deal Brexit all the way through to a repeal of Article 50 with Britain remaining a full member of the EU. Even Theresa May has no idea which outcome will end up happening. The financials were Fed day's biggest losers, as bank stocks saw big losses on big trading volumes, Axios' Courtenay Brown reports. Meanwhile, Goldman Sachs was the biggest decliner in the Dow yesterday. Shares fell 3.38% after the Fed said it would hold rates steady and signaled the end of rate hikes for the rest of the year. 5. 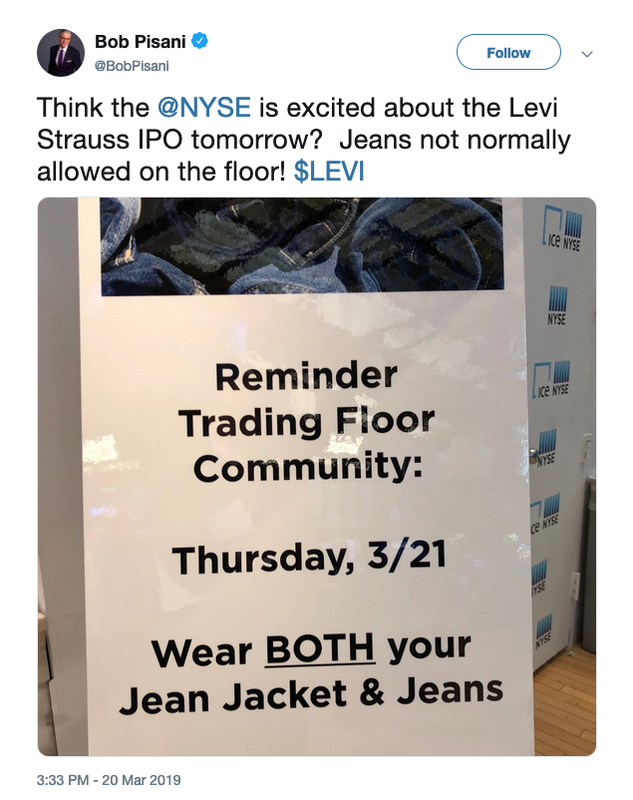 "Wear BOTH your Jean Jacket & Jeans"
The NYSE may be revising its dress code for today's Levi's IPO. What's happening: Levi's is slated to open at $17 a share in its return to public markets. The increased share price boosted Levi's valuation to the $5.8 billion to $6.6 billion range, and CNBC reports the IPO was 10 times oversubscribed. The big picture: The IPO has NYSE excited enough to roll back the long-time ban on jeans, but apparently only if traders wear a matching jean jacket. "Suit, sport coat or jacket should be worn, but a tie is not required. A dress, collared golf/polo shirt or turtleneck is acceptable. T‐shirts, tank tops or other casual shirts, jeans and shorts are not acceptable." Flashback: It would actually be the second time there's been a pause in the jeans ban by NYSE, which encouraged traders to wear Gap jeans for the company's 2009 IPO.